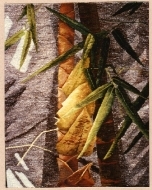 10 artists from each of three countries, the United States of America, Australia and the United Kingdom, are exhibiting small format hand woven tapestries in this international touring exhibition. The artists were selected by a co-ordinator in each country to demonstrate a range of experience and approaches in a small format with maximum dimensions, 10 inches x 10 inches. The exhibition aims to inspire and educate the onlooker in relation to the variety of approaches to both woven tapestry and the theme. This online exhibition showcases a group of selected artists. Elements: earth, air, fire, water is the title of the exhibition and the artists were asked to respond to one of the elements. The theme gave scope for personal creative expression as weavers could interpret the theme in any way they considered appropriate. Both abstract and representational responses are included in the exhibition. Weavers supplied an A4 sheet of information about their work with a brief illustrated description of source material and the design process plus a brief cv. The portfolio of artists’ pages is available to visitors at each venue for reference. In a time when we are connected around the globe easily and instantly through Facebook, Instagram and email for very little cost – why do we feel the need to send our work from country to country in an exhibition like this? We are a connected community of tapestry weavers and new communication technology has worked to our advantage in having internet sites like that of ATA’s and many more. I see so much more tapestry produced around the world via my computer screen than I ever did previously viewing catalogues and occasional exhibitions. However, instant images on screen, no matter how many pixels, just do not give enough information. In reality, on seeing a tapestry, the scale, materiality, weight, texture and form of the piece is absorbed and processed in an instant. Then there can be a lingering observation allowing every detail to be taken in. Each artist has their own individual artistic voice in their work and sometimes a signature style or way of working. As tapestry weavers, we experience the time it took the weaver to make every mark, think through every decision of colour or turn of the weft. The time it has taken is valuable in a time poor world and this indicates a commitment to making and communicating on a deeper and more personal level. The tapestries will last for a long time because of their tight warp and weft structure and strong materials. They are also kept and valued because of their direct connection to the weaver and the transmission of the thoughts and ideas of the weaver into the tapestry. The small tapestries in this exhibition represent an exchange between weavers, sharing their passion and response to the topic. They are also like gifts sent out to be viewed around the world by any visitors to the exhibitions, giving people a tangible pleasure from experiencing them and an intimate view into the private world of an individual tapestry weaver. Ideas about the Elements: earth, air, fire and water, represented by individual weavers’ views, are informed by geographic location, life experience, personal interests, research and creative interpretation. Earth: Earth Archive Diana Wood Conroy (Australia) describes her work as, “A fossil of crossing threads in the elemental archive of earth.” As an archaeologist she has focused on an image from a small fragment of ancient textile discovered in a Cypriot tomb and viewed under a scanning electron microscope. The crossing threads now do not contain any textile material but have become a fossil made of elements of earth (GE in Greek), stone residues and organic traces. As a tapestry weaver she has interpreted this image as a precise linear form with tactile qualities and lustre through using metallic threads wool and linen weft. Tommye McClure Scanlin’s (USA) Earth: Fiddleheads Return is a complex woven image showing a detail of the natural world of north Georgia and western North Carolina in the Southern Appalachian Mountains of the United States of America. Tommye deliberately uses the slow medium of tapestry weaving because she loves the surface of flat woven tapestry, the intensity of colour as interpreted in yarn, and the significance of each movement of the weaver’s hands to the finished work. The piece is like a meditation on the environment that is so meaningful to the artist. Earth: Cores directly references core sampling, used scientifically to analyse the composition of the earth, in Sally Blake’s (Australia) three dimensional pieces presented in a wooden box frame. She is fascinated by the layers of the earth and the history/material properties that they can reveal. 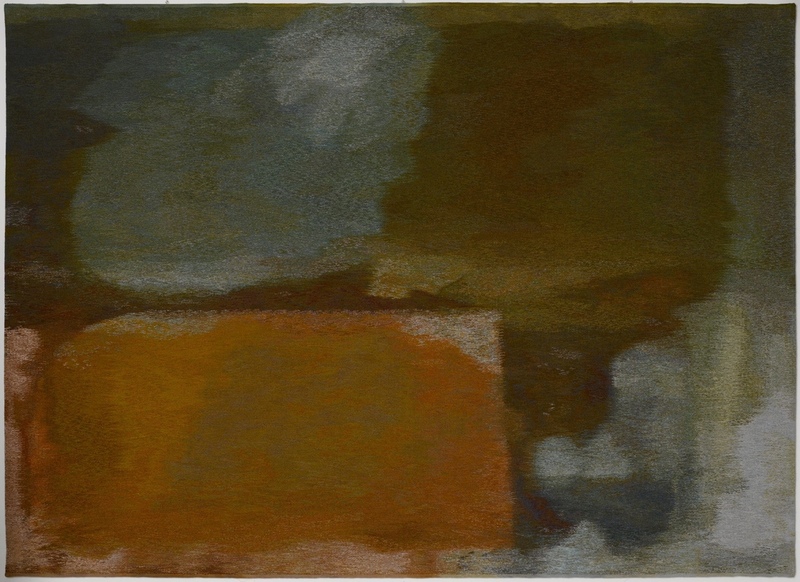 Lyrical lines, shapes and patterns are woven with plant-dyed wool, hemp and silk. By using the plant materials from her own garden and local suburb in Canberra she literally weaves the colour of the environment into the tapestries, making them as particular to place as core samples. Earth and Air: Pueblo Thunderbird reflects Sarah Warren’s (USA) current focus on studying Navajo techniques and weaving geometric forms in the abstracted landscape. This tapestry reflects both her own personal experience of ravens flying overhead on the mesa in Northern New Mexico where she lives and the legendary thunderbird of southwestern indigenous people’s culture. 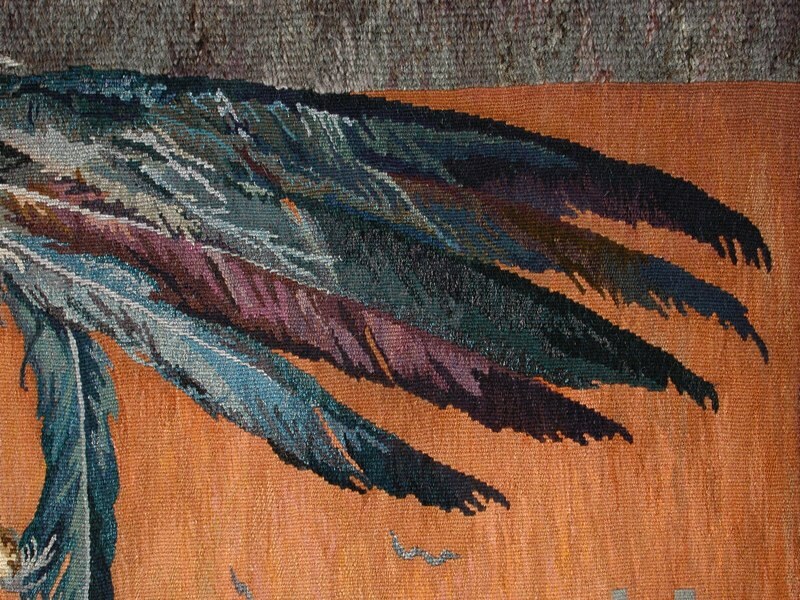 The bird, positioned between earth and sky in the tapestry, illustrates the bird’s connection to both earth and sky and perhaps also the reality of the raven as an earthly creature and the thunderbird of myth and legend. Air: 3 Steps to Heaven by Anton Veenstra, (Australia), responds to Eddie Cochran’s legendary rockabilly song. Visually the work plays with steps, colour and punctuations of added buttons taking inspiration from Zephirelli’s film Brother Son, Sister Moon where Francis approaches the enthroned pope and the series of magnificently tessellated steps are like an ascent to heaven. Veenstra thinks about the many references to ideas about physical spaces and connections/ladders from earth to air. Fire: Indian Summer conjures up the sense of heat that relates to the element, fire, in Dan Edwards’s (Australia) work. As an Australian with Indian heritage he has investigated ideas to do with ancestry, place, gender and heritage. 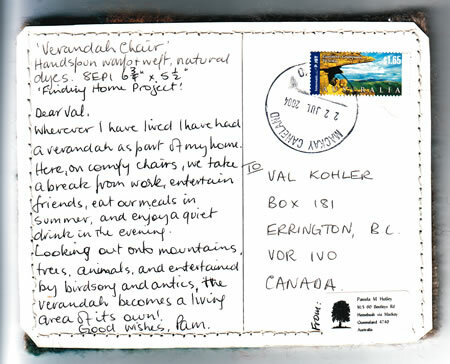 Recently, spending time in India as an Artist-In-Residence, he experienced the colour, smell and moods of the country. Sitting at the loom he processed the innate knowledge gained and wove intuitively, letting each shape of mixed colours on the bobbin dictate the next. Fire: Born of Fire is the intriguing title of the tapestry by Christine Paine (UK). Fire may be a natural part of her being as she came from Scunthorpe in the industrial North of England, where raw iron ore is transformed into red hot molten metal, then rolled and squeezed into toughened steel. However, the tapestry was inspired by staring into a log fire and watching the decorative curves of the steel grate against the flames. Water and Earth: Lake Reflections by Tricia Goldberg (USA) is an image split equally between mountains, grasses, rocks and trees and their reflection in water. It is detailed in the weaving as if trying to capture every aspect of the country experienced in reality. While hiking out in the Sierra Nevada Mountains in northern California Tricia absorbed the environment, while later, sitting at the loom, there was time for re-calling of the image, quiet consideration and re-creating the experience. Dimity Kidston’s (Australia) childhood experiences by the sea provided inspiration for Waves Rolling In. Like many Australian children she holidayed with family at the coast and watched the different moods of the sea – crashing waves on the sand, clear, aqua waters or dark and moody depths. Weaving as an immersive process allows for quiet reflection and the memory of water transported her back to the sounds and smells of the oceans experienced through the acute focus of the child. Water: Loss by Christine Sawyer (UK) literally and poetically spells out her emotional response to environmental concerns about climate change and pollution in relation to water. News items and scientific papers inform her about current issues which she then draws on to develop studies in ink and acrylic. From these explorations an image is chosen to work into a cartoon for tapestry. The word, loss, became a catchphrase when considering data collected in the polar regions about retreating glaciers and accelerating losses of sea ice. Although you are viewing this as a screen-based image, I hope you can see the exhibition at a venue in Australia, UK or USA as the exhibition tours. Valerie Kirk studied at Edinburgh College of Art, Scotland. 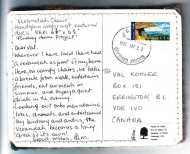 In 1979 she became a weaver at the Victorian Tapestry Workshop, Australia. She then worked in all states of Australia before moving to Canberra in 1991 to be the Head of Textiles and Senior Lecturer at the Australian National University, School of Art. As an artist, writer, teacher and public figure she has made a significant contribution. While actively maintaining her practice as an artist, Valerie’s remarkable capacity for achievement has seen her inspire and lead community tapestry projects, research Australian Indigenous textiles, direct significant projects, guest lecture on international textile tours and create major works. During 2004-2013 she was commissioned to design and weave five major tapestries to celebrate Nobel/Japan Prizes in Science associated with the Australian National University. Awards such as the Australia Council New Work grant, ACT Creative Arts Fellowship, Muse Arts Woman of the Year Award and the Canberra Centenary Community Tapestry project mark substantial success and her artwork is documented in the Telos Portfolio Collection publication.